Well, it is Non-Fiction Monday and I wanted to share with you the really intriguing and awesome book that I read over the weekend (and am planning on booktalking to 4th graders today... will report back on that front). By 1863, the Union army had established blockades around the southern ports that supplied the Confederate forces. The Confederates desperately needed supplies, but how could they destroy the ships guarding the ports? James McClintock and Horace Huntley had an answer. They developed a submarine designed to sink Union ships, the H.L. Huntley. At first her track record wasn't so great. She sank twice before accomplishing her goal of attacking a Union ship. Her third try was the charm. She approached and successfully torpedoed the USS Housatonic. But then disaster struck again. For reasons still not known, she sank, trapping and killing eight crewmen. The Hunley waited at the bottom of the ocean for over 130 years... because, although both Confederate and Union forces searched for her, no one could find her. In 1995, a team of searchers finally found the remains of the historic submarine that paved the way for submarine warfare and on August 8, 2000, the Hunley saw daylight for the first time since she sank in 1864. I had never heard the story of the H.L. 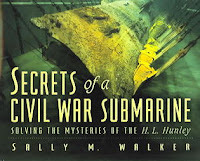 Hunley before I read this book and I found it to be totally fascinating. Ms. Walker begins with a history of submarine development and the Hunley's early test runs and failed missions. Unlike subs of today, she was powered by the crew, which turned cranks to power the propeller. They piped in air from the surface to breathe. In the last two-thirds of the book, Walker talks about the excavation of the remains. Archaeologists had to be extremely careful with the artifacts, lest they destroy something important. As they found items, the original position of each item was recorded so that archaeologists could piece together theories about what happened to the sub and why she sunk. Even more importantly, the remains of eight crew members were still within the ship and scientists wanted to study the remains and then give them a proper burial. Photos are included of the excavation process and they enhance information provided about the delicate excavation process. Also included is an author's note, source notes, a glossary, and an index. I think this is a terrifically interesting story that will hook kids in late elementary school on up. You've got warfare, shipwrecks, and buried "treasure"... what more could you want? Also, it looks like Ms. Walker's adapted the information in this book for a younger audience in Shipwreck Search: Discovery of the H.L. Hunley. The Booklist review says it's for grades 2-4. I haven't yet read this one, but it sounds like it would certainly be worth checking out! Abby...this book sounds fascinating. Thanks for a great review.